Guy Opperman MP, Minister for Pensions and Financial Inclusion, hosts a special event at Portcullis House, Westminster to report on the DWP’s feasibility study and launch a consultation on next steps, with a view to introducing new legislation in the 2019 Queen’s Speech. The Work and Pensions Select Committee hosts an informal meeting of industry representatives, after which the Chair Frank Field writes to the Pensions Minister reiterating again the importance of Government support in the key areas of compulsion legislation, identity verification, independent governance and appropriate regulation. The Tax Incentivised Savings Association (TISA) tweets that Amber Rudd MP, the newly appointed Secretary of State for Work and Pensions, speaks very supportively of the pensions dashboard initiative at their Annual Conference. New Model Adviser reports a source familiar with the dashboard project as saying the DWP’s feasibility study will recommend compulsion, an industry levy and an implementation entity to govern the ecosystem for pensions dashboards. In their Principles and Guidance document for the implementation of IORP II’s benefit statement provisions, the European Insurance and Occupational Pensions Authority (EIOPA) recommends that pension schemes’ benefit statements should be aligned to national pensions dashboards. In their Savers versus Spenders report, Aviva find that 40% of employees aged 46 to 55 do not know how much they have saved for retirement and are therefore approaching retirement ‘blindfolded’. In the detailed Budget 2018 document published by HM Treasury, the Government confirms (on page 80) that the DWP will consult later this year on the detailed design of pensions dashboards and will work closely with the pensions industry and financial technology firms to make this a reality – with provision (on page 36) of £5m of extra funding in 2019/20 to help with this. New research from the Pensions Policy Institute, sponsored by the ABI, highlights that there could be approximately £19.4bn of lost defined contribution pension pots in the UK – a major and growing issue that could be reduced by the introduction of pensions dashboard services. In response to oral questions in Parliament, the Pensions Minister Guy Opperman says that he and DWP colleagues are “in daily contact with industry figures as we prepare our feasibility report and plan for the roll-out of the dashboard”. He also wishes to “make it acutely clear that the Secretary of State and I, and all the members of the DWP team, are completely behind the pensions dashboard”. Writing in Pensions expert, the Pensions Minister Guy Opperman reiterates that an industry-led dashboard, facilitated by government, will harness the best of industry innovation. He says that DWP will shortly report on the findings from the feasibility study, and move forward from there, over the coming weeks and months, in conjunction with industry, to establish to the right model, with government protection where necessary. He repeats too that we should not underestimate the size or complexity of the challenge. Origo publish a detailed FAQ paper on the similarities and differences between Open Banking and “Open Pensions” (as a natural successor to pensions dashboard). Writing in Money Marketing, People’s Pension Director of Policy and External Affairs Gregg McClymont argues that the risks for Government of signing off on a dashboard look heavy when compared to the rewards, meaning that dashboard governance must be handed to the new single financial guidance body. Provides clear and neutral information about our pensions. As at 3 October, over 50,000 people had signed the letter. Interviewed by New Model Adviser at the Conservative Party Conference, the Pensions Minister Guy Opperman suggests that dashboard legislation will be introduced in 2019. He says: “The hope is we will get in at the next Queen’s speech in the summer of next year. We will get a pension bill in which we will do pension dashboard and the legislation required in particular”. In her speech to the Conservative Party Conference in Birmingham, Secretary of State for Work and Pensions Esther McVey reiterates the Government’s commitment to the pensions dashboard – watch here at 15:50. She states that “we will be giving people the opportunity to access their pension information through an industry-led pension dashboard building on the Government’s Check Your State Pension online service”. Conference organiser Finance Edge (FE) holds a Pensions Dashboard Summit of pensions industry leaders under Chatham House rules. Prior to the summit, FE published my latest infographic on the dashboard project’s status. Well known pensions blogger, Henry Tapper summarised his thoughts on the day in a blog post. Separately, a House of Commons Library Briefing Paper on the dashboard was published on the Parliament UK website. The Society of Pensions Professionals (SPP) Annual Conference is reported in a Pensions Age article. The People’s Pension Director of Policy and External Affairs Gregg McClymont is reported as saying “the government has issues over its confidence in releasing every single piece of pensions data in the UK”. In a positive Professional Adviser article, Simplitium Head of Pensions Business Development Tom Hibbard writes that already some progressive and pioneering firms that have been involved in building and testing the dashboard prototype, and if everyone gets behind it, surely nothing can stop us? In an FT Adviser article, Experian’s Richard Howells describes the digital, data powered future. But he warns that their research shows an incomplete dashboard could lose half its audience and thus create an industry white elephant. On Tuesday 18 September, 20 providers were reported as meeting to discuss a way forward for the dashboard initiative. The meeting was widely reported, including in a Professional Adviser article. The key reported points emerging included the importance of the government publishing its feasibility study as a matter of urgency, and the need for the government to legislate to ensure the whole industry is compelled to participate. In an ABI blog article, Matthew Burrell sets the record straight on some dashboard misconceptions, including that wanting there to be a government sponsored dashboard is not the same as wanting there to ONLY be a government sponsored dashboard. In an excellent Comment piece, Times Financial Editor Patrick Hosking is supportive of the dashboard initiative, reminding us that, in the future, the average couple will be trying to keep track of 24 different pension arrangements. In her regular column, Times Personal Finance Editor Anne Ashworth refers to Tuesday’s Ministerial Statement which confirmed that dashboard will not be abandoned. However, she says “there can be no shouts of ‘hurrah!’ until a firm date is set for its implementation in its most detailed form — which is the wake-up call the nation needs”. According to an article from Times Political Editor Francis Elliott & Financial Editor Patrick Hosking, it was the Prime Minister Teresa May herself who requested the Secretary of State for Work and Pensions to press ahead with dashboard plans. Meanwhile a Computer Weekly report states that the Government’s Infrastructure and Projects Authority (IPA) has recommended that the Gov.uk Verify identity assurance programme (which could be critical for dashboard services) should be terminated. Later in the day on 4 September (the day that Parliament returned from its summer recess) a written statement from the Pensions Minister was published, accompanised by a DWP Press Office tweet from the Secretary of State. The announcements, widely reported in online and other media, confirmed that the Government would support the pensions industry with the delivery of pensions dashboard services, but did not provide any further detail on the nature of that support. The DWP feasibility report is still awaited. By lunchtime on Tuesday 4 September, over 180,000 people had indicated that they want a dashboard by signing the Don’t scrap the pensions dashboard petition. This number had doubled from 90,000 on 26 July, so I tweeted that citizens had been signing the petition over the summer holiday period at the rate of one every 38 seconds. 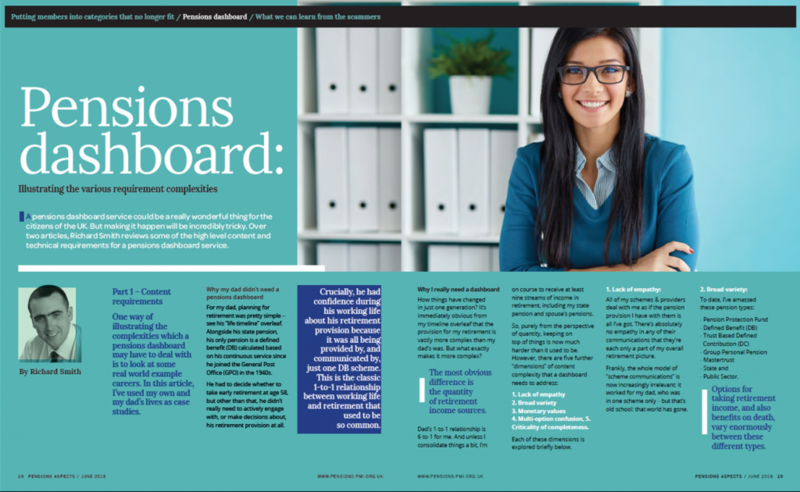 My Part 2 article on dashboard technical requirements is published on page 19 of the September 2018 edition of Pensions Aspects magazine from The Pensions Management Institute (PMI). 1 September 2018 – Why can’t we have the pensions dashboard? In her regular column, Times Personal Finance Editor Anne Ashworth asks if the entirely unprincipled Wonga was able to exploit technology, why shouldn’t pension savers have the same access to the benefits of this resource? We should demand to know why we cannot have the pensions dashboard. In a second article in as many days, FT Pensions Correspondent Josephine Cumbo reports that the pensions industry is preparing to launch its own dashboard if the Government withdraws its support for the initiative. Reporting in an FT article, Pensions Correspondent Josephine Cumbo refers to a 38 Degrees forecast that, on average, not having a pensions dashboard could cost 10 million UK citizens about £15,000 each in terms of lost pensions. In an FT Opinion piece, BBC Radio 4 Money Box Presenter Paul Lewis outlines why the pensions dashboard is still stuck on the blocks and why the original target delivery date of 2019 will now be all but impossible to achieve. Paul also speaks about this to Claer Barrett on the FT Money Show. In a Pensions Expert article, AHC Head of Client Services Karen Partridge, after describing how responsibility has now largely passed to the individual to manage an array of pension arrangements all maturing at different times, asks: how far have trustees adapted how they communicate in line with these changes? She suggests it is time to look again at the pensions dashboard concept, especially given that trustees can only control what happens in their individual schemes. Trustees should prompt members to include pensions from all sources in their thinking, and this should be taken into account when developing scheme-specific technological solutions. In a Money Marketing article, F&TRC Director Ian McKenna argues that Esther McVey is both brave and right to call time on [the Government’s involvement with] the pensions dashboard, but it should not be the end for the concept. The industry now has an opportunity to take back control and implement a practical and achievable roadmap. Royal London Chief Executive Phil Loney speaks in the business slot on the BBC Radio 4 Today Programme about their 2018 Interim Results. Asked (at 1:23:00) about current sources of uncertainty, Phil identifies Brexit and Government policy on pensions, in particular the pensions dashboard. He says “there are still some big holes in Government policy and the pensions dashboard is a really important requirement for people to save effectively and get value for money. We hear rumours that the Government might not now be willing to back it because it doesn’t want to take on another big initiative – we can’t let Britain’s savers down: we’ve got to find the legislative time to address these issues“. Royal London also headline this issue in their LSE Results Announcement. In a Money Marketing article, Thameside Financial Planning Director Tom Kean argues that the dashboard initiative was always going to falter due to complexity, cost and consumer lack of demand. He says that putting together an amalgamated interpretation of a person’s pension assets takes qualifications, years of experience, and lots of time – it simply isn’t possible to do this with a dashboard with the range of pensions out there. Two well known industry commentators (John Lawson and Henry Tapper) both call for a rapid feasibility response from the DWP. 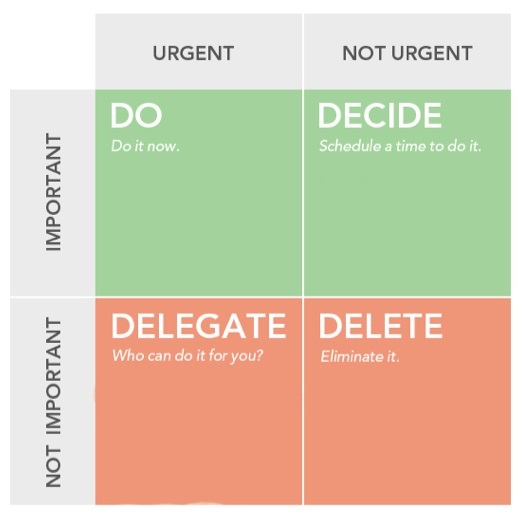 In a Money Marketing article, John says if the dashboard is to be a success it absolutely needs government involvement, with the ideal situation being for government, regulators and industry to work together. In a blog article, Henry says dashboard services should be both “high integrity” and “high impact”, best achieved by a public private partnership. 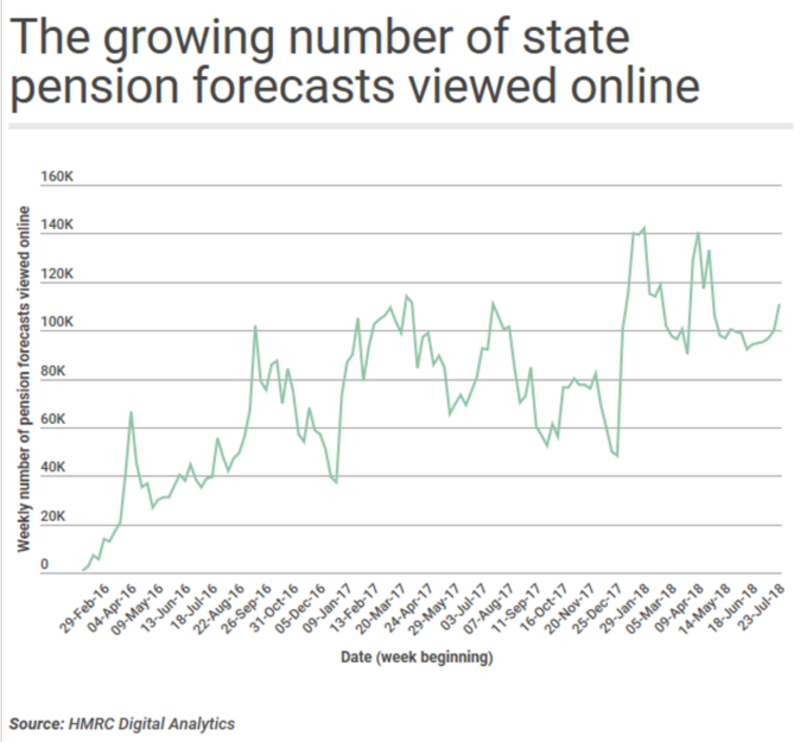 Further evidence that there is strong, and growing, demand amongst UK citizens to see their pensions information online: Professional Pensions reports the results of their Freedom on Information request which revealed the number of views of online state pension forecasts grew by 36% in a year – from 3.3m in 2016/17 to 4.5m in 2017/18. As the number of signatures in support of 38 Degrees’ “Don’t scrap the pensions dashboard” petition reaches 130,000, a Retirement Planner article explains that the topic can now be considered for debate in Parliament (having passed the 100,000 signatures threshold). In a powerful article, City A.M. Features Writer Katherine Denham sets out why dashboard is one of the most common sense ideas to come out of Government, and why it would be crazy to ditch it. She ends by saying: “If the dashboard is indeed sent to the scrapheap, it will be another example of the Tory party’s complete misalignment with the views and values of younger generations“. In response, Baroness Buscombe, DWP Parliamentary Under-Secretary of State, confirms that the Government is “currently exploring the many complex issues associated with developing a pensions dashboard: our feasibility work is nearing completion and we will report to Parliament in due course“. Parliament returns on Tuesday 4 September. In answering a supplementary question, the Baroness states that “we are working through the options around scheme participation: the decision whether to compel participation depends on a number of issues, such as the functionality, delivery model and governance of the dashboard. We will set out the Government’s view in due course”. The rumoured scrapping of the pensions dashboard initiative is covered in articles in the mainstream Sunday press including the Sunday Express and the Mail on Sunday. Meanwhile, over its initial weekend, 38 Degrees’ “Don’t scrap the pensions dashboard” petition secures 80,000 signatures, and the number continues to increase. At a hearing of the Work and Pensions Committee, the Pensions Minister Guy Opperman is questioned about the previous day’s report in The Times but states that no decision has been made about how pension dashboard services should be delivered. He reiterates the Chancellor of the Exchequer’s enthusiasm in 2016 for dashboard services, but says the DWP’s feasibility work is a perfectly legitimate consideration of how the service should be provided and the way ahead. Once decisions have been made, they will be communicated: the Minister hopes this will be fairly soon, certainly this year. ABI – It is vital the Government stands by its promises: the pensions industry is committed but we need Government involvement to ensure the system works fairly for everyone. PLSA – It’s vital the Government sticks to its word: the industry is strongly behind this initiative and we fully expect the Government to continue leading on the dashboard. And the campaign website 38 Degrees launches a campaign addressed to the Secretary of State: “Don’t scrap the pensions dashboard“. DWP’s long awaited feasibility report, “for release shortly”, is due to build on the initial industry-led pensions dashboard work and to establish a path towards delivery. However, an article in The Times, reports that the Secretary for State for Work and Pensions Esther McVey is said, by sources, to believe that the pensions dashboard service should not be provided by the state, with an announcement due after the start of Parliament’s summer recess on Tuesday 24 July. In their major Hitting the Target report, the PLSA recommend (amongst several other key measures) that new retirement income targets should be displayed on pensions dashboards, and that there should be at least one high-profile dashboard hosted by a major public body, such as the single financial guidance body. A Professional Adviser article reports how the ABI Head of Retirement Policy Rob Yuille called at a recent conference for there to be both a government dashboard and multiple commercial dashboards. In a Daily Telegraph article, Experian is reported to have found that one in eight pension records have the wrong address attached to them in one large pensions database. In a BusinessNewsWales article, Quantum Advisory Partner Stuart Price argues that it’s important not to rush the dashboard development and risk making a mistake; the right thing to do is take the appropriate time to ensure we get it right first time. In the response to the Work and Pensions Committee’s Report on Pension freedoms (published on 5 April – see below), the Government confirms that the DWP’s feasibility study is for release shortly. The People’s Pension publish a press release summarising their research findings that seven out of 10 UK workers with a private or workplace pension want a single pensions dashboard to help them keep track of their savings, with nearly half admitting that they don’t know how much they’ve saved for their retirement. In a Professional Pensions article, Stephanie Baxter discusses the increasing argument that the dashboard’s launch should be delayed in order to get it right the first time around. However, if there is a delay beyond 2019, it should not too long as savers are crying out for the dashboard. Pensions Policy Institute Director Chris Curry highlights their recent analysis that only a quarter of citizens understand how much state pension they will get thus undermining effective retirement planning. Following their scale analysis paper in April (see below), Origo publish a press release announcing that they have successfully scale tested their dashboard infrastructure for the anticipated usage by 15 million active consumers. In their Engagement Deficit report, ShareAction find that, subject to further future clarification, nine of the largest automatic enrolment pension providers intend to supply member data to the proposed pensions dashboard. Retirement report: In a suite of recommendations accompanying their 14th annual Retirement Report, Scottish Widows state that people will lose confidence in the dashboard if some schemes or plans are missing, so the priority for the dashboard’s first phase of delivery should be for it be fully populated with all defined benefit, defined contribution, public sector and state pensions. Industry survey: In the results of an industry survey, TISA also finds overwhelming support for mandatory pension provider participation to ensure full coverage, but with nearly three quarters of respondents preferring a multiple dashboard solution over a single dashboard. Press articles: In a Professional Adviser article, Space Managing Partner Marilyn Cole writes that we need really firm commitments from all government departments and regulators to get all pension information on to the dashboard and not just the pensions for the younger defined contribution and auto-enrolled generation. And finally, in a Pensions Expert article, Andy Tarrant (Head of Policy and Government Relations at The People’s Pension), writes in support of a single, public-good dashboard, as called for by the Work and Pensions Committee but at odds with the TISA findings above. My personal case study is published on page 18 of the June 2018 edition of Pensions Aspects magazine from The Pensions Management Institute (PMI) (screenshot below). The Association of Consulting Actuaries (ACA) elects Jenny Condron as its first female Chair. In a press release commenting on her election, Jenny highlights the importance of the pensions dashboard initiative: “If we can make headway supporting initiatives like the dashboard, then we’ll achieve a great deal”. Adam Afriyie and Jeremy Quin, Conservative Members of Parliament for Windsor and Horsham respectively, ask the Pensions Minister some questions about the pensions dashboard in Parliament. As well as congratulating Prince Harry and Meghan Markle on their wedding at the weekend, the Minister confirms his view that a properly constituted dashboard, developed in collaboration between the FinTech industry and Government, can help nudge people to save more and deliver great progress for everyone in the UK. In an extended press release, Origo Managing Director Anthony Rafferty and Chief Architect Kenneth May describe how the relatively new User-Managed Access (UMA) open security standard could allow dashboard users to control who can access their pensions data and for how long. This, they argue, would create a better user experience which would enable consumers to become better engaged with their pensions. In its final report, A New Generational Contract, the Resolution Foundation’s Intergenerational Commission states (albeit on page 187, 85% of the way through the report) that the pensions dashboard will provide an extremely useful tool for individuals to track their various pension pots and their value. The report goes on to say, however, that individuals would be better served if it were also easier to consolidate pots. The ABI five point plan, launched at their Retirement Interventions and Innovation Event in London, states that pensions dashboard content should be integrated with the Mid-life MOT. Dashboard services should also be aligned to a revised suite of tailored and phased pension communications which are given to citizens throughout their lives. 18 April 2018 – 15 million dashboard users? The financial press reports on a recent analysis paper published by Origo which found that pensions dashboard services will be attractive to approximately 13-15 million people. The House of Commons Work and Pensions Committee publishes its Report on Pension freedoms. The report states that the case for a publicly-hosted pensions dashboard is clear cut. The case for multiple dashboards hosted by providers is far less convincing and would add complexity to a problem crying out for simplicity. The report goes on to recommend that the Government should mandate all pension providers to provide the necessary information to a single dashboard operated by the new single financial guidance body, over a phased implementation period to be agreed. A DWP spokesperson is reported in New Model Adviser as saying that the update on its feasibility work, originally planned to be published in March 2018, will now be published “in due course”. The report is due to build on the findings of the initial industry-led work and will seek to establish a path towards delivery of pensions dashboard services. A two-day innovation event is run at Aviva’s Digital Garage in Hoxton exploring ideas for making retirement saving more accessible for Britain’s 5 million self-employed people. The TechSprint challenges teams of experts to develop practical interventions, focusing on the roles that technology, pensions dashboard and open banking could play in helping the self-employed build later life financial resilience. Of nine competing teams, the overall winners propose using open banking to smooth out irregularities in self-employment income while also earmarking rainy day savings and long term savings. In an extensive Professional Adviser article, Dunstan Thomas Retirement Strategy Director Adrian Boulding sets out a vision of the multiple potential uses of pensions dashboard services in the fullness of time. Writing in a Raconteur special report on workplace pensions, mallowstreet Chief Executive Stuart Breyer argues that the ways in which the industry facilitates retirement saving (including pension dashboards) need to be easy, simple, personalised, intuitive and rewarding. Delivering a keynote speech at the ABI Annual Conference, First Minister of Scotland Nicola Sturgeon endorses the “hugely beneficial impact” of the pensions dashboard initiative, in particular mentioning the role played by Edinburgh-based Fintech Origo. Which? publishes an extensive policy report, authored by independent consultant Dominic Lindley, setting out a suite of 12 recommendations for taking forward the pensions dashboard initiative, most importantly: comprehensive coverage, consistent display of pension information and control of dashboard providers. 9 February 2018 – If we build it, will they come? In a New Model Adviser article, Copia Capital’s Malcolm Small envisions a future world where pensions are discussed at dinner parties. He concludes, though, that it remains uncertain whether pensions dashboard services will finally engage UK consumers, but, if we don’t build the dashboard, we’ll never know. Flagging the recent Dependency Trap report from the Centre for the Study of Financial Innovation (CSFI), the new Origo Managing Director Anthony Rafferty comments, in an Actuarial Post article, that it’s important to get the dashboard basics right (for example, robust identification and pension finder services) so that firm foundations are laid on which dashboard services can be developed. In two separate articles, Experian’s Richard Howells and Dunstan Thomas’ Adrian Boulding set out how open banking, which went live in January, is the pre-cursor to a new world of “open pensions” in which pensions dashboard services will dramatically enhance consumers’ retirement experiences as well as providing significant opportunities for product providers and advisers. 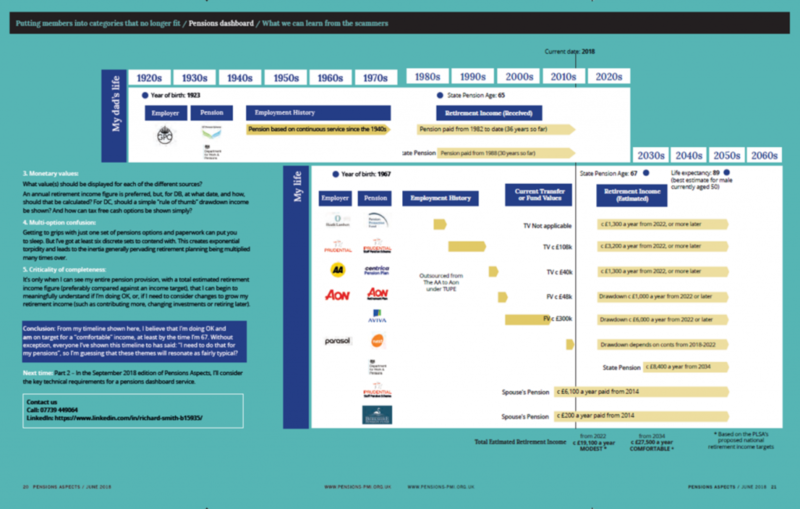 Using data from Pension Funds Online, Professional Pensions Editor Jonathan Stapleton uses Infogram to publish an online infographic of the UK’s 20 biggest funded DB schemes. With total assets between them of approximately half a trillion pounds, these 20 schemes would make an excellent set of early dashboard volunteers. In particular, between them, they utilise all the major defined benefit administration systems (from which data would need to released for display on dashboards).